Juma Mosque of Shamakhi is the largest mosque of Azerbaijan. It is one of the first mosques of Azerbaijan after the Arab occupation of Caucasus. The Arabian writings reflected on the walls of the mosque show the construction year as 744 AD. This makes the mosque the earliest one in whole Caucasus after the Juma Mosque of Derbent, which was completed in 734 AD. Shamakhi Juma Mosque does not have analogue in Azerbaijan. Ornamental patterns decorates the entire facade of the mosque. The mosque has a rectangular plan. The size of the building is 46 meters length and 28 meters width. There is a large prayer hall which is divided into three separated sections. Moreover, each part of the mosque has its own prayer place and entrance. Therefore, Juma Mosque is also called three-hall mosque. Such kind of design is very similar to the architecture of well-known Great Mosque of Omayyad in Damask which was built in 708 AD. Throughout the history, the mosque was damaged and reconstructed several times. First, in 12th century, Georgian invaders attacked Shamakhi city and destroyed the mosque. But the local ruler Shirvanshahs State briefly ordered to repair the mosque. The second re-construction works in the mosque carried out in 17th century, during the Safavid Dynasty period. Turkish traveler Evliya Chelebi visited Shamakhi city in 1656. He noted that Juma Mosque is the largest religious construction of Shamakhi. In 1859, as a result of the strong earthquake in Shamakhi, the mosque damaged again, but quickly repaired after one year in 1860. About 40 years later, another earthquake happened in Shamakhi and ruined almost all the city along with the Juma Mosque. Local people collected some funds to carry out the reconstruction. They created a special committee for this purpose. They asked the local famous architect Ziverbey Ahmadbeyov to take the project, but Ziverbey Ahmadbeyov wanted to preserve the exterior of the mosque in its original form. The committee rejected the condition and the architect also discharged the project. Later, the committee offered the continuation of the mosque project to another architect, but this time, to a foreign one- Józef Plośko. He agreed to take the project and completed the work in 1909, however made several changes and additions to the original project and design. In 1918, Juma Mosque witnessed the most terrible event throughout its 1200 years long history. Armed units of Armenian extremist party- “Dashnaktsutiun” under the command of terrorist Stepan Lalayan attacked the Shamakhi city and killed 17000 Azerbaijan people living in the city and nearby villages. General Thompson- Commander in Chief of the Union Army located in Baku noted: “Armenians destroyed the city completely, and then burned, none of the mosques could escape destruction”. Local people who wanted to save their lives ran to the mosque and hided there. But Armenian armed groups, burnt the whole mosque with the people inside. Even today, the marks of the fire is visible from the walls of the mosque. But most importantly, local people still remember the massacre and their heals have not been healed yet. For a long time, the mosque remained as ruin and during the soviet time communism regime ignored the reconstruction. 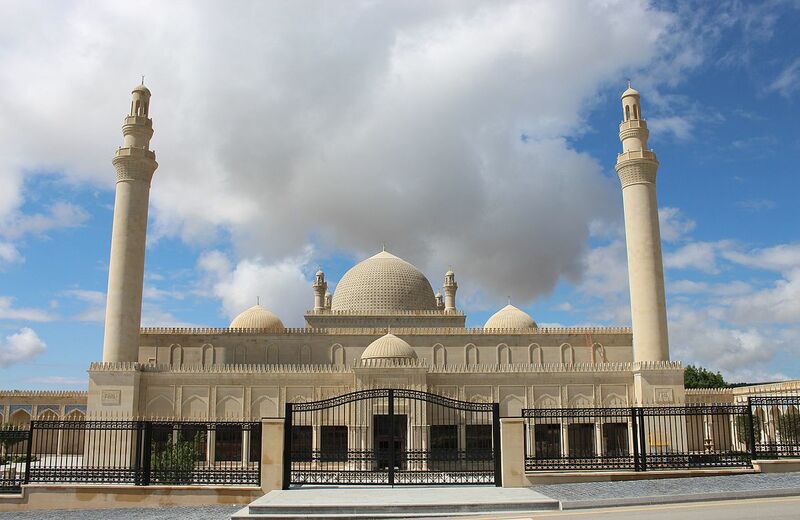 In 2009, Azerbaijan Government started the reconstruction of the mosque. Historical and sacred place of Shamakhi people returned to them. The mosque again, became the largest mosque of Azerbaijan and one of the largest cult structures of the Caucasus.